Ivor David Balding (1939-2014) was born March 3, 1939 in Manhattan, and grew up in a horse farm in Camden, South Carolina. His father was the famous British polo player Ivor G. Balding (1909-2005), who, along with his brothers Barney and Gerald, played polo in the United States throughout the 1930's at the Meadow Brook Club on Long Island, then the national center of the sport. Ivor G. Balding subsequently went on to work at the C.V. Whitney Farm in Old Westbury, New York, before becoming manager of the Whitney Farm in Lexington, where he raised and trained racing-horses. In Britain, Ivor David Balding’s grandfather had sold horses to various circuses in his time, and David himself was introduced to the circus and theater worlds through his father’s connections. He began his show business career as stage manager at the Westport Country Playhouse for legendary Broadway actress Eva Le Gallienne (1899-1991). Le Gallienne, who had performed in her youth as an equestrienneA female equestrian, or horse trainer, horse presenter, or acrobat on horseback. at the illustrious Cirque Medrano in Paris, gave David an introduction to the Fratellini family, who helped him land a job as spotlight operator at the famous Parisian circus. There, David had an invaluable initiation into the circus world. Back to the U.S., David Balding worked for Joe Papp at the New York Shakespeare Festival, and then founded the New Theatre in New York. During his tenure there, he produced 21 plays, including The Knack, The Ginger Man, Scuba Duba, Steambath, The Man in the Glass Booth, and Lenny. His productions were nominated for two Tony Awards and won five Obie Awards. The vagaries of theater production, however, forced him to change course, and David went to work for CBS Sports in Europe, where his attraction(Russian) A circus act that can occupy up to the entire second half of a circus performance. to the circus only grew bigger. This led him to conceive and co-produce the Circus World Championships: Held annually in London from 1976 to 1986, this circus competition was broadcast on the BBC (with network specials for both CBS and NBC) and became quite an event in the European circus world. While in England, Balding also managed Jimmy Chipperfield's Circus World. 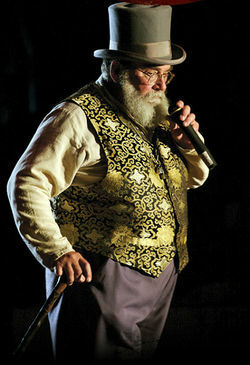 In 1980, David Balding helped produce the Big Apple Circus's first Holiday production at New York’s Lincoln Center for the Performing Arts. Afterward, he settled to his family farm in South Carolina and in 1984, he adopted an orphaned young African elephant named Flora. Flora was born in Zimbabwe in 1982, where her parents had been killed in a culling. She had then been sold to an American trainer, and David purchased her from him. Then, David was faced with a problem: What to do when you own an elephant and have to take care of her? The answer was quick to come: In 1985, he co-founded Circus Flora, the star of which would be Flora. David Balding was the producer and artistic director of this highly acclaimed traditional, yet very theatrical one-ring circus from its inception, and Flora remained the center attraction(Russian) A circus act that can occupy up to the entire second half of a circus performance. of the circus until her retirement in 2000. Circus Flora is a unique circus with highly theatrical productions that have been performed in the U.S. at venues including the Glimmerglass Opera House; six years at the Spoleto Festival in Charleston, South Carolina; Lincoln Center’s Ta’ziyeh. In Washington, DC, Circus Flora erected the first Big Top Tent ever at The Kennedy Center. David Balding was also the circus consultant to Paramount Pictures for the film, Big Top Pee Wee (1988) and artistic consultant for the Los Angeles Circus Festival in 1990. He also collaborated with director/choreographer Martha Clarke on Endangered Species (1990), presented at the Brooklyn Academy of Music's Next Wave Festival. In 1991 and 1992, Balding served as the first artistic director for First Night, St. Louis' family arts festival celebrating New Year's Eve. In 2008, Ivor David Balding received the Excellence in the Arts award from the Arts & Education Council of St. Louis for his lifetime dedication to the arts. As he entered the twenty-first century, Balding's health deteriorated: He was plagued with severe arthritis and other ailments, and in time he made plans for his succession at Circus Flora, and decided to retire in 2016. He died unexpectedly of a head injury after falling at home on May 9, 2014 in Weldon Spring, Missouri. He was married to Laura Carpenter, and had three sisters, but he didn't have children—beside Flora, who survived him. Flora and David Balding were the subjects of a documentary, One Lucky Elephant (2011).